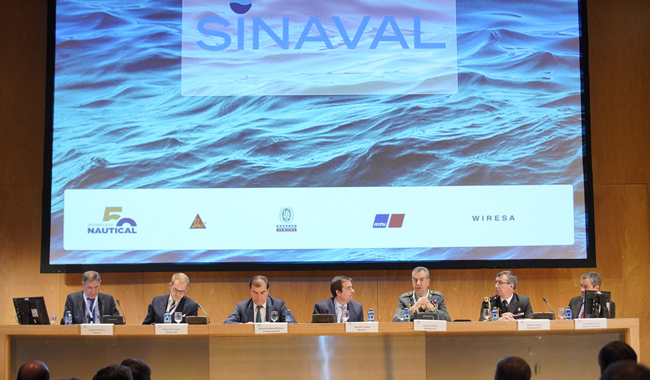 José de Lara, Vice-President of the Spanish Maritime Cluster, this morning opened the Sinaval Conference, discussing State Ships Vision and Trends in Maritime Security and Defence (Auditorium 1, BEC). “Defence and security are the essential guarantee of our future”, said Lara. Leading sector figures took part in round table discussion, moderated by Juan de La Cueva, Business Director for National Security and Defence, Navantia. Participants included Spanish Civil Guard General, Luis Pérez Martín, who assessed the Civil Guard’s jurisdiction at sea, maritime surveillance measures, ocean-going ships and international permanent deployment, among other issues. Fernando de Cea, Head of the Customs Surveillance Agency Maritime Technology Area, gave a detailed analysis of the agency’s maritime surveillance and special operations strategies. Joaquín Maceiras Saborido, Assistant Director of Operations at the Maritime Safety and Rescue Society, explained the work carried out by his unit, with more than 25 years’ experience in rescue operations, tackling pollution and marine traffic monitoring. Vice Admiral Manuel Antonio Martinez Ruiz, Director of Naval Engineering and Construction, Spanish Navy, focussed its talk on the evolution undergone in recent years on maritime safety and defence until reaching the current model, leading up to existing and future naval technology of the Spanish navy. International participations included Pierre Perrocheau, Naval Executive Secretary of the Sea Europe Association, which supplies the EU member States with the experience, technology and capacity to organise their operations, and Captain Marcello Zoppi, Chilean Naval Attaché in Spain, who spoke of the main roles of the Chilean Navy, and its capacity and naval and marine challenges in the short and long term.